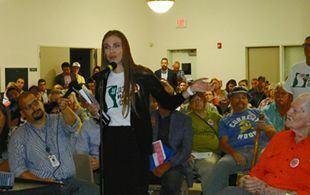 EAST HARRIS COUNTY  A packed house of residents and government officials met last Thursday night at the Highlands Community Center for an update from the federal EPA (Environmental Protection Agency) on plans to remove the toxic waste from the storage pits in the San Jacinto River. The EPA also wanted to hear comments from the audience on their opinions about the Proposed Plan for removal. The meeting lasted 2 1/2 hours, with Gary Miller of the EPA making a slide presentation, followed by about 35 local residents and interested parties expressing their positions on the plan. The meeting opened with remarks from Congressman Gene Green, who was instrumental in getting the waste pits put on the federal Superfund Priority List in 2008. He said dioxin is in the sediment, and needs complete removal. He was concerned about barges that might strike the pits and release the dioxins. Gary Miller of EPA reviewed the history of the Waste Pits site, since its start in the 1960s, and its rediscovery forty years later. He detailed how the proposed plan called for a 19 month removal of 152,000 cubic yards of material on the north impoiundment, and the backfill with 2 feet of clean soil. On the south impoundment, 50,000 cubic yards will be removed, and a building removed and replaced. Regarding the 6 plans outlined in the Corps of Engineers study, he said None of them are reliable for All Storm Events except the final 6A which EPA adopted. He detailed the problems that have continually plagued the current cap, and the needed constant repairs and monitoring. Miller revealed that even this month, a new scour or erosion 8 feet deep had been discovered in the river bed along the East side of the cap. He said that the proposed solution will be safe, with sheet piling retaining the wastes, monitoring during the work, and contingency plans in case of storms or floods. He also revealed a disappointing schedule for the balance of the work. A Record of Decision (final) will be made early in 2017, then 1 year of negotiation with the PRPs, 2 years of design and engineering, and finally the removal work would commence in 2020 and continue for 19 months. The EPA is now soliciting comments from the public, until November 28th. They may be submitted in writing to the Remedial Project Manager, US EPA Region 6, 1445 Ross Ave. (6SF-RA), Dallas TX 75202, or by email to R6_San_Jacinto_Waste_ Pits_Comments @epa.gov. Many comments were received at the meeting, including residents from Highlands, Lynchburg, and Channelview. Only a few or the 400 present opposed the complete removal. Many of the speakers expressed personal stories of poor health resuting from the environment. Speaking in favor of removal were Baytown City Manager Rick Davis, John Banks, Pam Bonta, Alma Pennington, Linda Barnes, Anna Holt, Josephine Tittsworth, Scott Jones of the Galveston Bay Foundation, Kathlene Garland of U. of H. Clear Lake, Brant Manchen of the Sierra Club, Sam Slade, Deborah Rothers, Pamela Marr of Channelview, Eddie Williams, Jim Silverstein of Lee College, Bud Hall, Melannie Scruggs, James Frederick of McNair, Kathy Dubler, and many others. EPA deputy director Sam Coleman ended the meeting, promising to read and respond to all comments that were made.